All the standard Scott Henderson accoutrements are there -- Suhr 'D' shape neck profile, 6100 jumbo frets and Gotoh 1088 steel block bridge. Pickups are Suhr's JST V60 pickups -- this was pre-Suhr Fletcher-Landau, which are Henderson's current favorite pickups. Interestingly the Body Option in the spec sheet indicates alder, EXTRA LIGHT. 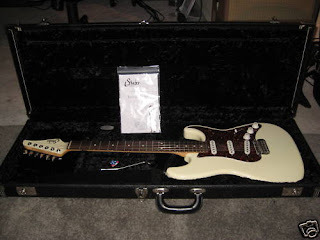 According to the seller also, this guitar was eventually returned by Scott to John Suhr. 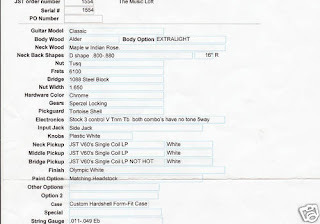 And from the spec sheet it looks like it ended up in Music Loft's inventory. If you're bidding on this axe for the played-by-Scott Henderson factor, do the necessary research before forking over the dough! Hey Clinton, this is Ava from Jemsite. Had something to run by you but can't find an e-mail address. Can you write me back at Charismaqueen100@gmail.com? Thanks so much.